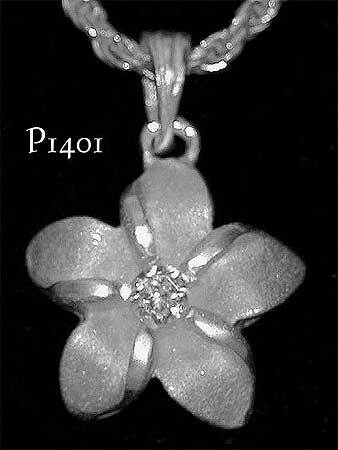 Sterling silver Hawaiian Plumeria (frangipani) pendant with light white frosted finish and central eye of sparkling clear cubic zirconia. Matching earrings also available. Measurements: 12mm diameter flower, 18mm drop including bail. Weight, 1.20 grams. The bail takes up to 2.00mm diameter chain. Also available in sizes 10mm and 15mm.